With a lower investment cost, higher production rate and simplicity of maintenance, the Chariot iScrub 20 stand-on commercial scrubber family meets and exceeds all expectations with up to 58% operational savings versus competitively sized walk-behind scrubbers. 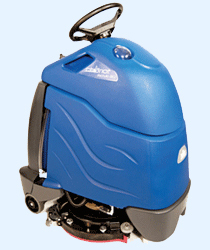 Unmatched productivity when compared to walk-behind scrubbers sized from 17" to 26". - Designed with Windsor's Chariot Patented Stand-On Cleaning Technology* that significantly increases productivity and cleaning quality. Wide open accessibility for service. Hygienic, easy to clean recovery tanks. Easy access to batteries. The center-pivot squeegee uses Aqua-Mizer Technology, creating a cleaning chamber that holds the solution so that it is used to the fullest effectiveness. Aqua-mizer helps you lower your water and chemical consumption, extending up to 50% greater coverage per tankful. Solution dump hose rotates to the floor for easy, operator-free dumping. 42" x 26.5" x 50.75"